My October TEDx Dayton Talk, “Lessons My Daughter With Autism Has Taught Me” is now live on YouTube. This presentation was probably the most difficult to prepare for of any I’ve done. The process made me deeply search what I think, what I feel, and what I believe – not only about Amelia, but about education and all students. I hope the result, and Amelia’s story, can serve as an inspiration to think deeper about learning and expectations. On March 1, 2017, I saw a whole lot of awesome. My daughter, Amelia, was invited to attend a private “Launch Party” for a brand new booklet, published by Cincinnati Children’s Hospital Medical Center’s (CCHMC) Division of Developmental and Behavioral Pediatrics (DDBP). The booklet is titled “Sharing Hope: The Stories of our Patients and Families”, and it will be distributed free of charge to families of individuals who are referred to DDBP for various reasons. The booklet contains brief articles written by individuals who have previously been referred to DDBP, and their family members. Amelia’s page in “Sharing Hope”. By the way, that stone wall behind her is Chateau LaRoche, the Loveland Castle! Amelia’s story is one of 26 articles featured in the booklet. The article is a summation of the contents of my “Ten Important Things Amelia Needs You to Know” Ignite-style presentation. I had an opportunity to meet some of the other honored guests there, and I feel very privileged to have met such wonderful people! Reading some of their stories after meeting them just makes it even more powerful to me. Families of people like Lily, Vineet, Patrick, Andrew, and so many more, have willingly told their stories with the intent of conveying encouragement and hope to others who are just learning what a diagnosis of “autism” or “down syndrome” or “spina bifida” will mean for their lives. The impact of a powerful network of caring professionals is what keeps CCHMC near the very top of U.S. News & World Report’s list of best children’s hospitals. But, there is something extra to be gained from hearing the experiences of others at a time when most families find themselves starting a journey nobody they know has gone through. Alongside the best medical treatment available, there is something soothing about a voice that can tell you honestly, “I know how you feel.” That’s something no medicine can provide. And, it has a lot to do with why these families chose to own their story and tell it, rather than try to hide the diagnosis that, quite honestly, changed their lives forever. Amelia’s diagnosis is a challenge, but it is not a shame. She rises to meet that challenge every day. That message of love, belief, and hope is conveyed throughout the pages of this booklet, and I am proud to be dad to such an inspiring young lady. A text transcript of the arguments put before the court is available from the website of the US Supreme Court. Endrew F. has autism. During his fourth grade year in the Douglas County School District, his academic achievement was slipping, and his behaviors became more and more detrimental to his educational progress. The family and the district went through many of the typical hoops that families and districts are familiar with in writing (and re-writing) an IEP for Endrew. Endrew’s family were not satisfied that he was receiving appropriate services under IDEA, and eventually took the step of withdrawing him from Douglas County and enrolling him, at their own expense, in a private school. The family then sued the district for the cost of the private program, stating that the school failed to provide an adequate system of academic and behavioral support for Endrew. The district countered that they met all the legal requirements and that Endrew was making enough progress to show that the district was in fact providing an adequate education. In the last step before the US Supreme Court, the Tenth Circuit Court of Appeals decided in favor of the school district, stating that if there was any educational benefit at all in what the school provided, they had met their legal obligation. Words are unfathomably important. Words like “appropriate”, “significant”, “meaningful”, and “some” come up a lot in these arguments, and in the previous case law. Each of them is designed to give the due process system its place in examining what is reasonable in a particular circumstance. This fuzziness may be frustrating in some instances, but it is the very thing that allows individuals the freedom to pursue what is best for a particular child and not be shackled to a particular strategy by a statute. In reading some parts of the transcript, some of the statements made by the attorneys and the justices seemed to indicate that they have a belief that some kids cannot be expected to achieve grade-level content because they have a disability. At times, it felt like there was a presumption that “performing at grade level” is the equivalent of “performing at the same level as everyone else”. This is untrue on its face, and I believe any classroom educator could tell you so. However, these were not classroom educators in the courtroom (except for one Stanford University law professor). If this case revolved around a student who was being denied a level of service due to their gender or race, I have little doubt that the arguments put forth by the attorney for the school district would be labeled as horrifically bigoted. But, because this was a child with autism, it felt at times that there was an inherent acceptance that this child could not possibly be expected to achieve at an academic level expected of every other fourth grader. Sad. I’m sure I have a deeper interest in this subject than some, due to the fact that I currently have a kindergartner who has been diagnosed with Autism. This case could significantly influence the educational environment she finds herself in for the rest of her school life. To that end, I want better for her than to have to learn in a school district that stands on “we did what we had to do by law, and that’s enough”. I’m no scholar on the US Supreme Court, but the tone and direction of the questions and discussion as delivered in the transcript gives me good reason to think that the US Supreme Court will rule that there is a responsibility on the part of public schools to provide more than just a “little better than nothing” (or, as the Court puts it, “barely more than de minimis“) education. Anyone who works with people who have been diagnosed with Autism knows that they are all unique individuals. However, there are some general characteristics that are recognizable in many such individuals. My daughter, Amelia, does best in situations where there is a familiar routine, and transitions are anticipated and done calmly and smoothly. If you have ever flown on a commercial airplane, you know that the process of getting checked in, getting through security, and actually boarding the plane can be filled with frustration, waiting, sudden changes, more waiting, occasional loud noises, and more waiting. Some typical people, even frequent flyers, have difficulty dealing with this situation using socially-appropriate behaviors. Imagine how much more difficult this can be for people with Autism. Many families have imagined that scenario, and decided that the prospect of flying in an airplane is something they don’t even want to attempt. SOAR stands for “Starting Our Adventure Right”. The SOAR program at Greater Cincinnati Northern Kentucky International Airport (CVG) is a collaboration of The Kelly O’Leary Center at Cincinnati Children’s Hospital Medical Center, The Autism Society of Greater Cincinnati, Delta Airlines, and CVG. The SOAR program permits individuals with Autism and their families to get a supported experience of every part of an airline trip – except actually taking off and landing. For this program, I had to attend a two-hour orientation session at the airport. This was a very valuable experience! I met other parents who were there for the same program, and got a lot of information about what we would experience. They also gave us some excellent visual support materials for what would happen on the actual day of the SOAR event. These materials included visual schedules for each part of the process, a “First… Then…” board, and some “Wait” cards. This allowed us some opportunities to familiarize Amelia with the schedules and the process long before the day of the actual trip to the airport. The cooperation of all the individuals from all the different organizations involved in this event was top-notch. The TSA agents knew we were coming, and that made a huge difference when we got to the x-ray scanners and metal detectors. If you are taking an actual flight, it is worth the time and effort to review TSA’s guidelines for flyers with disabilities and medical conditions before you even plan your trip. Once you know you will be flying, print and fill out the TSA Disability Notification Card to take with you to the airport. Also, call the number listed on the card three days before your travel dates (ALL departures AND returns) to request the assistance of a Passenger Support Specialist, who will assist you through every part of the security screening where you need it. These preparations can help avoid lots of frustrations at the screening location. No liquids may be taken through screening. But, you can take an empty bottle, sippy cup, or other favorite drinking vessel. Once you’re through security, there will be lots of bodega-style storefronts where you can get (for a price) a drink to put in that cup. All blankets, pillows, stuffed animals, and electronic devices will be expected to go through the x-ray machine. If someone is very attached to one of those items, prepare them for the time they will be separated from it as it goes through the x-ray machine. If this includes a communication device, note that as part of the information on the blue TSA card mentioned above, indicating that the individual’s ability to communicate is low to none while the AAC device is going through the x-ray machine. If a stroller or other apparatus can help with keeping the person calm, helping them move from place to place, or assisting with waiting, it is probably worth the extra hassle of taking it and checking it planeside. My daughter, Amelia, had no hesitancy at all with getting on the plane. Her older brother, though, did. He complained at home that morning about his stomach hurting (nerves), and that he didn’t want to go. We used the checklist and other materials that had been sent home with us for Amelia to let Quenton know exactly what he could expect to happen on this adventure. He read all the rules, and we made sure he understood them. He went through each step of the processes, and looked closely at the pictures to see if there was anything in them that made him nervous. In the end, he felt well-prepared not only to go through the process, but to help his little sister make it through this brand new experience, too. That part of the experience was gold. 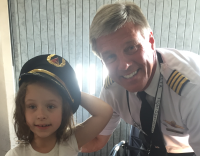 My daughter, Amelia, and her new friend, “Captain Bob”. If your preferred airport does not have a SOAR program, or something like it, to acclimate potential passengers with Autism Spectrum Disorder to the rules and routines of commercial flight, ask them about starting one. The program at CVG would serve as a great model for anyone wanting to bring the program elsewhere. If you live in the Greater Cincinnati area (I live almost 2 hours away, and it was well worth it), you have a family member who has a diagnosis of Autism, and you even just want to find out whether flying is something that will need more support and practice, I highly recommend the SOAR program. It is free for families to participate, and the experience is absolutely phenomenal.